Dommi top end disaster ! All four push rods knackered. The top end of each is mutilated with bits of torn aluminium all over the place. All four cam follower cups damaged, two beyond re using, although it may be prudent to renew all four. Circlip missing from gudgeon pin on one piston. The gudgeon pin has slid into the bore and created a massive groove in what appears to be a liner. One piston (already +.040") damaged beyond repair. The barrel has a piece of it's casting broken off at the base of the damaged bore. As this piece is not in the engine the barrel must have been installed in this state during the rebuild ! I'm now facing new liners, new pistons, new rings and new cam followers. I'm hopeful that all bits, especially the main piece of the dislodged circlip, have not and will not find their way into any bearings or gears within the crankcase. I've flushed it out to the best of my ability. 1. What type of failure causes this type of damage to pushrods and cam followers ? 2. Can I ignore the damage to the barrel casting and solve the problem with liners and new standard pistons ? 3. I am assuming damage to the bore is just due to the circlip either not being inserted properly or in it breaking ? More understandable than the push rod damage. 3. Is it safe to assume the missing piece of circlip has somehow been blown out through the exhaust system, or is it necessary to split the crankcase and search ? 4. Where is the best place to go for the replacement parts ? That sounds awful. Did you buy it from a dealer, in which case you may have a case against them? I would strip the engine completely as it sounds as though it's been assembled by an idiot so even if the circlip isn't in the crankcase waiting to create mayhem there may be other horrors is there. And anyway you'd always be waiting for the other hammer to drop. I had a comprehensive seizure on a Commando years ago (oil pipe blew off the filter) and the bent / broken con rod took a chunk out of the base of the cylinder casting. I stoned off the remaining sharp edge and it was fine afterwards. Although as the bike was stolen a few years later I can't speak for the long term. 1. It would appear that wrong pushrods may be part of the problem. If they were too short (as would necessitate the adjusters being as you describe) the geometry would be out, resulting in loading of the pushrod ends at a greater angle to the vertical than designed. The initial failure mechanism here will have caused wear debris from here to have dropped to the cam followers and initiated damage there that then self perpetuated. 3. I concur. It is very easy to neglect to check that the circlip is not properly seated if you are unaware of the possibility. The question is where has the wear debris from the barrel liner got too? The circlip must have gone into the crankcase if the rings are not broken (assuming it was there in the first place) so the worst case possibility is that it may have got into the main bearings or if broken enough, to the oil pump. Personally, I would suggest that a complete strip is necessary to check that there is no follow on damage or excess wear from all of the debris that has been floating around. Initial thoughts are that the camshaft lobes may also have suffered - as may the oil pump, mains, big end s etc or that you may have been lucky. Only a full strip will tell. As to where to get the parts. First get yourself a parts manual for your bike so that you can order the correct parts. All of the usual suppliers. (RGM, Andover Norton and Norvil) hold good parts coverage. Mike, I feel your pain! The engine was obviously built by Barney Rubble. You can't not re-build the whole engine now.. No point in spending good money on the top end and chancing the bottom. Probably best to take the barrels to whoever would press in new liners, and ask if the casting will take the trauma of the new fittings. They might not guarantee it? New barrels might be an option? I think that all that metal would have shown up vividly at the last oil change (or the first?). Both in the oil and on the magnetic? sump plug. Being cynical, it sounds like Barney Rubble thought it would be a good time to punt it on pretty quickly. I would definitely be on the sellers case very heavily. Take plenty of pictures and even get an expert witness if possible. You could well have a case even if you bought the bike "As seen". Do you have a copy of the original advert description ? Oh dear. I too bought one like that once. In my case, blasting media had not been properly flushed out of the crankcase when the PO rebuilt the engine.The oil did that job once the engine was run, destroying everything. I bought it from a West Country dealer, who didn't want to know, and I didn't have the will to take him to court. Best advice when changing a camshaft is that the followers should be changed too. Thus the reverse is also true, hence the need for a full engine strip. It is the only way that you will have peace of mind. It will be expensive. No, not from a dealer. The guy I bought it from knew little of it's history. I have been in contact with the guy he bought it from but, again, he didn't rebuild it. On the face of it it's a beautiful bike. The paintwork is immaculate. It is 12v with Boyer ignition. It has a belt drive modification. If you look around there has been amazing attention given to detail throughout the renovation. It just doesn't ring true that someone ploughing this much money into a machine would skimp on the engine ! I'm wondering if something has gone wrong since the rebuild and it was then fixed just enough to get it running. I gather from another reply that, if I replace the cam followers as seems to be essential given the damage, that I will need to replace the camshaft ! If this is the case then I have no option but to split the crankcase. As the camshaft seems to be in excellent condition I definitely hadn't forseen the need for such a costly replacement. I haven't even looked at what a new camshaft will cost ! Yes, aluminium push rods. They appear to be all alloy. The rocker ends are demolished so difficult to know if they had iron ends ! Ivor, Thanks for your offer of help. I'm still considering my course of action. From most of the replies it seems a full rebuild is required. As I'm being advised that if new followers are fitted then so should a new camshaft be, it would appear I have no option but to split the crankcase. As something of a novice at this it looks to be a daunting task - and expensive ! Foolishly it seems, paying loads of money for a bike does not guarantee you get a good bike. Dominators with std camshafts rarely have trouble with them and I'm not sure the followers are damaged from your description. Mine are still all perfect at nearly 60 years old. A light stoning is all that it usually needed. Don't mix them up.You may be looking at the rocker ends?.A std second hand cam is cheap, £20. If needed. Don't need an SS cam . Give us some photo's. There is a load of rockers on E-bay right now ,some may be for a later head. Give us some photos of the bike too.May stop the guesswork. If it helps I have bought restored bikes that looked beautifull but had stupid mechanical work done. I have a brand new Hemmings 2s cam you can buy for £130 if you want, I doubt you need it though. Hello Mike while you have a major rebuild on your hands please take the time to check the rocker spindle inner bushes in the head for ovality as they are prone to wear. All of mine were 1 mm oval and had to be machined and re bushed, i also modified my new spindles and end plates so that it is impossible for them to rotate in the future. ( Photo's atached )If you remember when we spoke i mentioned how much my rebuild cost as it was a no expence spared rebuild,but there is only one way to do a job like this and if its right it is expensive. Also if you have the alloy head check the push rod tunnels as sometimes when they changed from steel to alloy push rods they were inclined to rub the inside of the tunnels in which case the push rod tunnels will need to be machined to give a greater clearance. Mike do not contemplate not stripping the engine as a lot of that metal will have gone into the oil pump and all the other components also remember to clean the sludge trap.If you send me your e'mail i will send you some photo's of my rebuild. "It just doesn't ring true that someone ploughing this much money into a machine would skimp on the engine ! " Sadly, from my own experience, this rings all too true in these days of 'classic' bikes (and cars) being regarded by many as icons whose only real purpose is to be displayed as an ego trip by the (often fairly well-heeled) owner and for the envious, nostalgic reminiscences of those who view them. I've personally fallen for this sort of thing on at least three occasions (maybe I'm a slow learner or, as I prefer to think, hope springs eternal, and paying a fairly high price for an immaculately-presented 'fully restored' machine from an apparently trustworthy vendor should provide what it says on the tin - a fully restored machine). According to Murphy's law (though he was an optimist), it seems a total strip is needed. Thinking of the about 25 used bikes I've bought, 8 had only minor faults. 32% chance to aquire a decent bike. Among the good ones are a 99, a Goldie, a 16H, a Comet and a Venom. You mentioned at the start that all 4 cam follower cups are damaged, 2 beyond repair. It is always recommended that camshaft and followers are changed together. Certain suppliers will guarantee neither unless that is done. However if the faces of the camshaft are perfect, then you could get away with it, but with no guarantee.. The point really is that the engine needs stripping fully to be sure of finding out everything. At that point you can take a view on the camshaft. If in doubt, I would recommend changing it. I'm probably being a bit dense ,but can't imagine the damage you are seeing .,the cup on the top of the follower does very little work and even if indented could be cleaned up with a spare pushrod and a bit of fine grinding paste ,it does not need to be perfect as it does little. PHOTO please. Some years ago (don't ask how many!) I had a pushrod top wear down and cause grief. Reason the top cup wore down (solid alloy rods) was a rocker shaft had turned and this blocked the oil supply to the rockers. The 99 cam is not the same as the Commando. Unless you are talking 99SS. The drive was the same. Commando cam has Different lift ,timing and running clearances. Needs different pushrods and valve springs,different barrel clearances.Different life expectancy.lots of aged 7's 77's 88 and 99's still happily running orriginal parts. Lots of Commandos with new cams. Robert I,m not going to keep bouncing this about but the camshaft on the very early commando is the same as the 600 dommie 99.When Norton changed the cam in 1970 to what was known as the interim model camshaft part number 06 1084 the push rods and valve springs were different but that was due to barrel changes. I have checked the Norton parts list and checked with Norton tech dept today and the camshaft for early commando and 600 dommie are the same. You cannot have a camshaft with different profiles with the same part number. I agree with nearly everything you say. and its quite possible that the current makers think the parts are exactly the same and therefore simply interchangeable But they are not. You could likely run an early Commando or Atlas with a 56 Dommy cam and have no bother apart from a reduced performance and some extra clatter Put an Atlas or early Commando cam in the Dommy and you need to change other parts and increase the clearance in several places. So how can the old and new parts be the same?. Many times have I ordered Dommy parts and been sent Commando bits that don't fit or need modifying.It is just how it is. There were four main camshafts produced by the Norton Factory for their standard Dominator engined bikes. All have the casting number of T2219. Those for the Model 7 engine are best avoided if the plan is to rebuild a post 1956 engine and expect a decent road performance from it. The first camshaft was right for the early ‘Iron headed’ engine, in that it helped to produce enough power without the top half over-cooking. 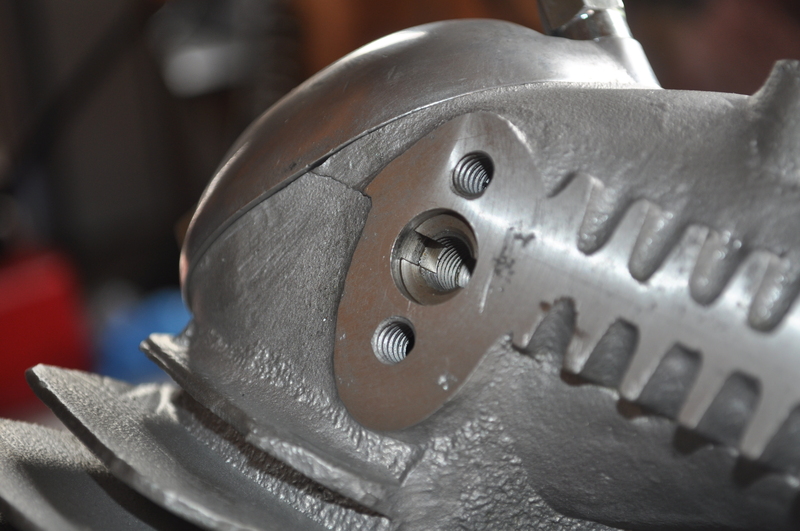 The later ‘Aluminium cylinder heads were able to cope with more power; especially those with the extended finning. So when the 99 engine arrived, with the ‘Daytona’ camshaft in 1956, this had extended times for valve openings, increasing the power, but also the valve train noise. The addition of a 0.010' ramp to its lobes, around 1959, to help quieten down the engine rattles. Hence the title of Q.R. camshaft. These identification letters generally being stamped onto its sidewall. The fourth variation of the camshaft arrived with the Downdraft SS cylinder heads. (But was also fitted to the non-downdraft head used on the 99SS). Basically it was the QR camshaft but slightly altered in profile and renamed as the SS. Most have a casting number of T2219@3. From 1960, this camshaft was a standard fitting for all the Dominator SS engines, including Atlas and Mercury. It even survived, in a modified form, to become a standard Commando part until ousted, for a while, by the arrival of the Combat 2S disaster. The earliest SS camshafts were stamped with X1 (Bracebridge) or X2 (mostly from Woolwich). The X2 camshafts were supposed to have deeper hardening to cope with the 650 engines power but the late John Hudson claimed that the X1 version was produced with greater accuracy. Later Mercury camshafts often just have the casting number. The SS camshaft will fit into any of the pre-1960 engines and run quite happily as long as excessive revs are avoided. Otherwise valve float can occur, especially above 6000rpm. But who (track day lads excepted) hammers an engine that much nowadays? 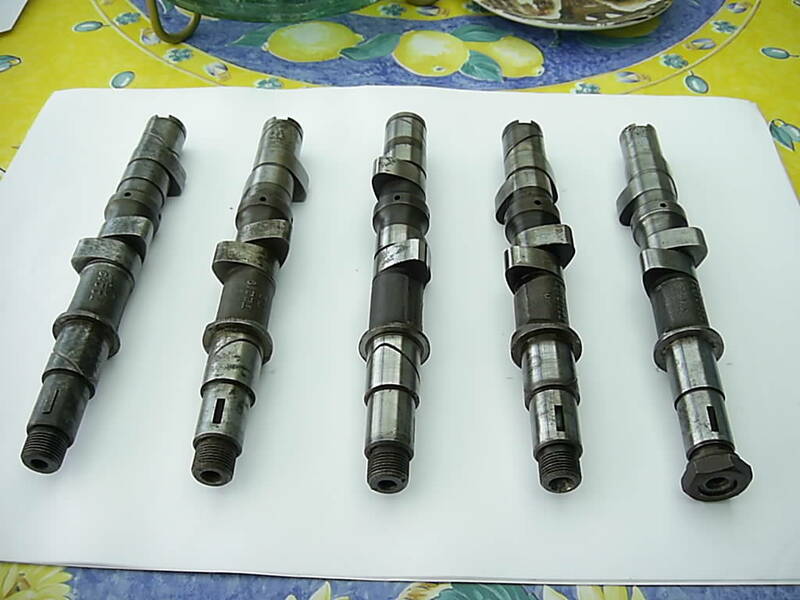 The attachment shows the four Dominator camshafts used in production bikes from 1949 up to 1969. The camshaft on the far right came from a very early Dunstall tuned 99. His later versions having the option of a fitted needle-roller bearing and positive oil feed. Thank you Phill. It seems possible that the bikes current problems stem from fitting perhaps 88 push rods in a 99. If a new cam and pushrods to suit are purchased its also possible that the barrel will need releving and the 99 clearances of 3and 5 thou be increased . 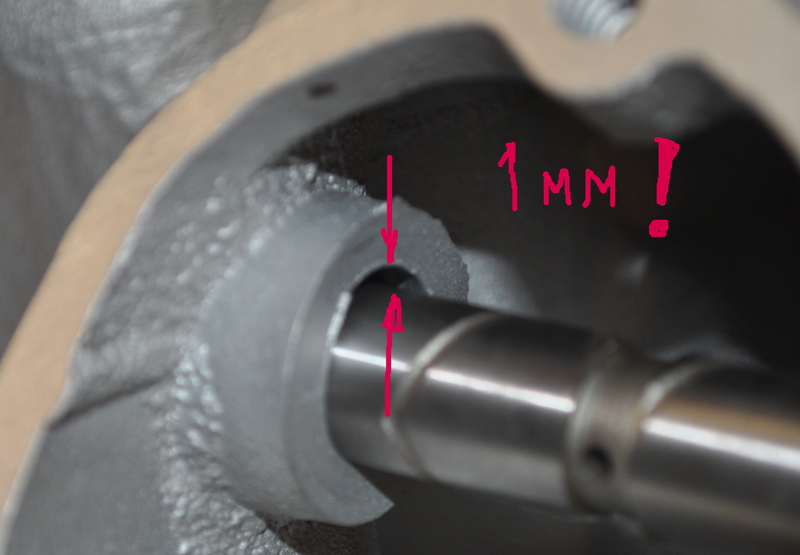 The cam followers are damaged, not where they sit on the camshaft, but the cups where the rods fit. Photos attached. What is a Hemmings 2s cam ? Rocker spindles and bushes in ine look to be good. In fact everything about the head seems to be in good nick. My email address is mikeshaworth@btinternet.com. Here are some photos.I can only sent two per message - I think ! The followers rod seatings are indeed well hammered from careless assembly work.In the old days of no cash I would have buzzed off any crumbly bits and lapped the seating with some fine paste and a spare rod. They would most likely worked fine as long as the rods were properly seated on assembly. I'm a bit more fussy these days and would happily lightly stone some SH followers and use with the milder QR cam (also cleaned up if needed). The mild cam with oil bath on these 88/99 engines gives the parts an easier time than on many later engines.The Hemmings cam (which you don't need) is a Commando profile cam made to fit a Dommy . And the remaining thickness of the bottom barrel spigots outside the sleeves (which have already been fitted) is so small it can hardly do anything anyway. So I'd resleeve. I agree with Robert. What you do about damaged top edges of the followers is up to you. The edges don't carry much of the loads so are not all that important when running but they do retain oil and do help hold the rods in place on reassembly. New ones will look nice but will they really work better? Can you see the condition of the cam shaft? And the important bottom faces of the followers? It does look like wrong push rod lengths. There are lots of lengths and I doubt if going by the book will help a lot. Maybe use the wrecked old ones to help measure? Did the tips of the rocker adjusters touch the rocker covers? If the adjusters were wound out as far as you say them they must have done so. The shoulders round the follower rod seats also help retain the rods in the advent of valve float,the odd missed gear can happen when you are chasing that Fireblade!. I will look at some cam followers tomorrow if there is enough meat below the damaged pushrod seat, I can machine them deeper using a set of imperial sized domed milling cutters and also mill off the damage to give the hole the correct depth, if it works you will need custom length pushrods made up. Would be a shame to throw away the stellite that has worked with the camshaft and not showing any wear. I think 99 inlets are the longest Norton rods,could possibly rework those for new exhaust ones,and just get longer made up for the inlets. Another thought ,If the wrong springs fitted would that have allowed lots of valve float and damage?. I've read on this site about all-alloy pushrods, and now I've seen photos of damaged ones. Are these common? Mine are alloy tubes with steel end caps. Surely much superior? I assumed they are standard because when I bought one some years ago, it also had the steel caps. Alloy with steel end caps , Normal. This may be an option but how do I get pushrods made ? I wouldn't know what length to specify or where to go to get the work done. Given the numerous and diverse responses to my original posting, clearly by some very competent engineers, I'm beginning to wonder if I have the ability to rebuild this engine to an acceptable standard. My normal approach would be to specify my bike to someone like Andover or RGM and say "sell me some pushrods to fit that bike". I'm beginning to suspect that this approach won't work. There seems to be so many different push rods out there, varying by length and material ! Now you are saying have some made. I went to a meeting of Bournemouth NOC members on Wednesdayand I came away struggling to get a definitive answer from the varied opinions on the pushrod issue. Hello Howard. How do I determine what kind of camshaft is fitted ? Is there a number on it somewhere. ? You could try a dial gauge with the rod down the tappet holes. Check the lift against 'dyno dave's Atlantic green' web site says. You won't get an accurate profile but should get the lift. Don't despair. For push rods you could start with what you have and work out how much shorter you need. Nortons have two series of engines, twin chain ending with the 20M3, and single chain starting with 20M3S. I show the primary series of production TC cams minus the "daytona". First two are 3" radius lifters and the 22729 is flat lifter. This profile is better/more accurate than the one on my website. It will replace the one currently there. If you decide to fit new or secondhand followers ,then you can buy a set of standard 99 pushrods with no problems, Worth checking that the rocker ends that engage with the pushrods are not damaged by the mahem that has been going on.The likelyhood is that you will have a Daytona QR cam and flat base followers would suit. But anything is possible over the life of the bike. It only took a few seconds out in the shop to check my 10 TC cams. They have...T2219(SA)1, T2219(SA)2, T2219(SA)3, or cast core w/no marking, or aftermarket fully machined blanks. However in my cams the SS cams are only on the latest core blanks T2219(SA)3 or cast core w/no marking,. The measured 22729 SS cam have X1, X2, or NO hardness marking, and Lift is what identifies the cam not a hardness marking. Unfortunately , here in the US I have had no access to components like the daytona cam. Since the Daytona cam precedes the QR, I would avoid it in preference to the QR. Everyone seems to be saying the daytona and QR are almost the same? IMO For a 99 a SS grind may be a bit severe considering the 99 reputation. However they are almost nonexistant here and just getting enough parts here to get one running is almost a miracle. If my research proves correct the barrels need to be SS machined to work with the SS cam, the lifters would be flat, later push rods and the valve springs need to be the later style. Not sure if your 1959-99 has the components to build a 99SS without a lot of updates to your components. The QR cam is the Daytona grind with added ramps and was fitted to my 1960 99** (built late59 ) and my 61 88 . Both had flat followers. Seems possible that the radiused followers were phased out around 59 in the uk .I will do some checking .Interesting that the graph shows the cam timings to be the same for the QR and later cam. Thats not what the books say. My 88 engine is 814XX with the QR stamped cam and radius lifters. This motor sat unmolested for decades and seemed to only have cylinder and top end work done to it. I have been looking to profile a daytona cam just for curiosity sake. The difference may well be minor but I'm sure my rig will measure the difference. The Mitutoyo dial indicator I used was a "new in the box" given to me because it was ordered wrong and was an odd ball that indicates/measures to .0001". The brass shoe in the rig can be interchanged with flat or 3" radius. The SS cam had an 8 degree lead inlet opening over exhaust closing ,The Daytona QR has only 2 degrees. according to the blurb. John Hudson (who built some fast motors) was very particular about maintaining that lead. The only practical way of doing that is to play with the tappet clearances I think.